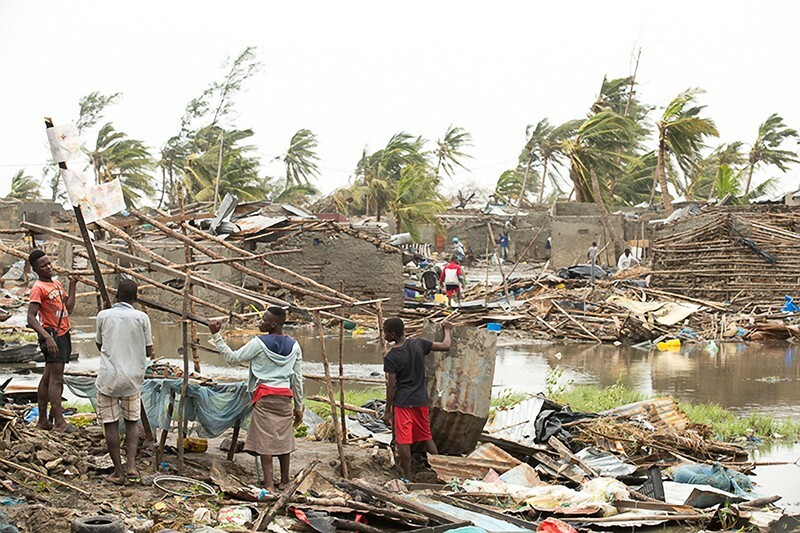 The catastrophic storm has affected nearly 2 million people in Mozambique alone. A combination of highly concentrated rainfall, low-lying land and poor-quality housing and infrastructure made Cyclone Idai — which hit southeastern Africa on 14 March — one of the Southern Hemisphere’s deadliest storms, say researchers. The tropical cyclone made landfall in the Mozambican city of Beira on 14 March, and has killed more than 750 people in Mozambique, Zimbabwe and Malawi — making it the second deadliest cyclone to hit the Southern Hemisphere. Flooding caused by the storm has displaced thousands of people and some 1.85 million people have been affected so far in Mozambique alone, the United Nations estimates. Officials warn that the death toll is likely to rise. Past major storms in the Southern Hemisphere include a cyclone that hit the Indonesian island of Flores in 1973, killing 1,650 people. 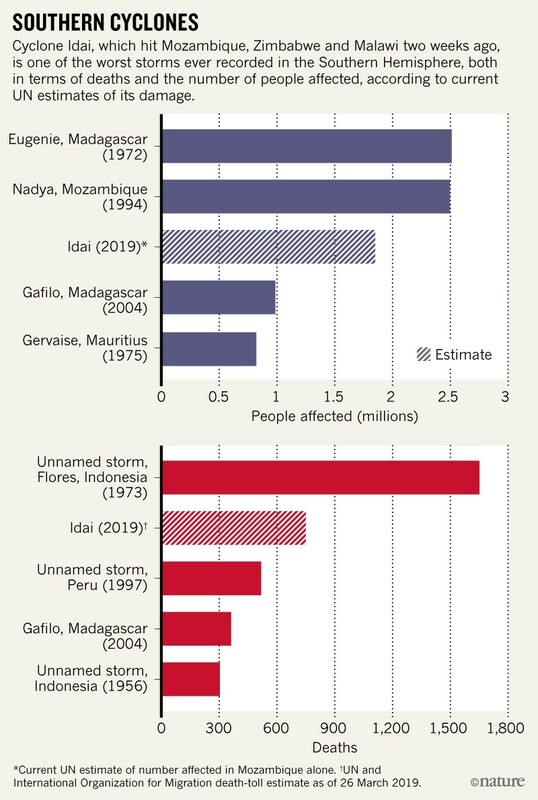 Cyclones that struck Madagascar in 1972 and 1994 did not cause as many deaths, but each affected 2.5 million people (see ‘Southern cyclones’). And unlike the island of Madagascar, where tropical cyclones occur every year, such storms make landfall in Mozambique only about once every 10 years, meaning the country is poorly prepared to deal with their severe effects, says Jennifer Fitchett, a physical geographer at the University of the Witwatersrand in Johannesburg, South Africa. Over the past 25 years, several major cyclones have hit southeastern Africa. Cyclone Galifo, which battered Madagascar in 1994, was more intense than Idai in terms of wind speed, but the devastation left by Idai is set to surpass that left by Galifo. “It doesn’t look on paper like it should be the worst one, but it’s about the other characteristics that go with it,” says Hannah Cloke, a hydrologist at the University of Reading, UK, who works on flood forecasting systems to help aid agencies prepare for the effects of extreme weather, including in Mozambique. Idai moved slowly and dumped a lot of rain over a small area, contributing to severe flooding in the low-lying region. The population there is also highly vulnerable, adds Cloke, because many people live in poorly built houses, which are easily damaged by extreme weather. If someone’s roof blows off, she says, they won’t be able to climb on top to escape rising flood waters. Six of the ten deadliest cyclones to hit the Southern Hemisphere since 1900 have happened since 1994, according to data from the Centre for Research on the Epidemiology of Disasters (CRED) at the Catholic University of Louvain in Brussels, Belgium. Several factors can explain why a large proportion of the deadliest cyclones have occurred in recent decades, says Fitchett. This is partly due to expanding populations, particularly in coastal regions that bear the brunt of a cyclone’s worst effects. Record-keeping has also improved, meaning damage and casualty figures are better reported. Climate change also plays a role. Over the past 70 years, there has actually been a slight decrease in the number of tropical cyclones, says Fitchett. But because the ocean surface is warming, when storms do form, they can intensify quickly. Data on the deaths caused by disasters such as cyclones are likely to be underestimates. These figures represent only the immediate impact of the disasters, says epidemiologist Debarati Guha-Sapir, director of CRED, and there’s a big data gap when it comes to tracking long-term effects. Months after the event, people in poorer countries, such as Mozambique, often die from knock-on effects — malnutrition and infectious disease, for example — but these deaths will not ultimately be recorded as connected to the disaster. “All of those will happen six months from now. And six months from now, people lose interest,” she says.